On Wednesday, the NCAA called a federal lawsuit by Pennsylvania Gov. 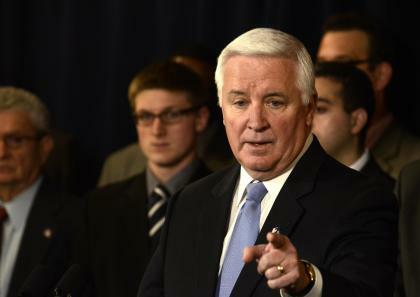 Tom Corbett over severe sanctions against the Penn State football program an "affront to all of the victims in this tragedy – lives that were destroyed by the criminal actions of Jerry Sandusky." However, one of those victims, so-called Victim No. 4 who was abused by Sandusky for years on the Penn State campus, has never supported the way the NCAA handled the case, according to his attorney. Moreover, the attorney, Benjamin D. Andreozzi of Harrisburg's Andreozzi & Associates blasted the NCAA for trying to play the role of victim and never asking Sandusky's actual victims their opinion in the case. Perhaps most egregious, it assumed that the victims would find Corbett's lawsuit, but not the NCAA's actions, as an "affront." That allowed the NCAA to essentially use the real victims as a public relations tool without any knowledge of whether the assertion was accurate. "Victim No. 4 was very disappointed when he learned of the NCAA sanctions several months ago," Andreozzi told Yahoo! Sports on Wednesday. "He was particularly upset the sanctions were so broad that they impacted people who had absolutely nothing to do with the abuse or the failure to properly report the abuse. "The NCAA acted as if it were the victim in this tragedy, and failed to even take the pulse of the real victims before imposing its will," Andreozzi continued. "I am not suggesting that PSU should have walked away with no sanctions or that the victims should have controlled PSU's penalty," Andreozzi said. "Rather it was a mistake to impose a broad sanction that gave little consideration to the people who had nothing to do with the abuse, and inexcusable to not at least consult with the real victims and weigh their thoughts as a factor in the decision-making process." The NCAA declined to respond to Andreozzi's comments. Victim No. 4 has not yet filed a civil suit against Penn State, in part because civil actions have been frozen by the courts. The possibility remains, however. The school has said it plans to work with Sandusky's victims to deal with damages. Sandusky was convicted in June of 45 counts of child sexual abuse and is serving 30 to 60 years in a southwest Pennsylvania prison. Victim No. 4 was the prosecution's star witness, the first called in the nearly two week trial in Bellefonte, Pa. He was just 13 years old when he first met Sandusky in 1997 on the Penn State campus during a summer camp sponsored by the Second Mile charity designed to help at-risk kids. Victim No. 4 was poor and fatherless, and Sandusky became a constant presence in his life by using the allure of the Nittany Lion program to draw him in. Through the ensuing years he was repeatedly abused by Sandusky while being given unprecedented access to the Penn State team, where Sandusky was still the defensive coordinator. Victim No. 4 was taken on road trips and bowl games, given sideline access during games and was a fixture in Penn State locker room. He befriended a number of Penn State players who were unaware of Sandusky's abuse of the boy. Now 28 years old, Victim No. 4 forcefully detailed Sandusky's abuse and mind games and made a mockery of Sandusky's attorney, Joe Amendola, during cross examination. He later spoke at Sandusky's sentencing hearing and apologized to the younger victims for not having the strength to come forward sooner and stop Sandusky. In July, the NCAA used what it acknowledges was "unprecedented" powers to bypass the traditional enforcement process and levy heavy sanctions on the Penn State program. That included a four-year postseason ban, a loss of scholarships over a four-year period, a $60 million fine and the vacating of all victories from 1998. Corbett said Wednesday he will file a federal antitrust lawsuit against the NCAA questioning its authority to level the penalties and it's sidestepping of all normal procedures. Corbett said the Sandusky case fell outside the NCAA's realm of ruling on academic issues or extra benefits provided to athletes. "The NCAA should not have sanctioned Penn State," Corbett said. "This was a criminal matter, not a violation of NCAA rules." The NCAA said the lawsuit "appear[s] to be without merit." Victim No. 4 however, who still lives in Central Pennsylvania, believes, like Corbett, that the NCAA's actions are punishing the wrong people. "From former football players, who were friends and role models, to the 'mom and pop' PSU merchandise and food vendors living in the community, all were impacted by the NCAA's decision," Andreozzi said.